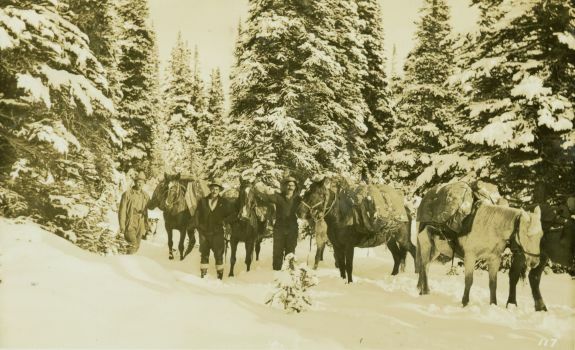 Item is a photograph of a Thorne, Fred and Jack standing with six pack horses in the snow. Item is the same as image I-57617 in the Frank Swannell fonds at the BC Archives. Metadata Elements for scanned image: Spatial Resolution - 1600dpi (master image); Signal Resolution - 8-bit colour channel ; Colour Mode - RGB ; File Format - .tif (master); .jpeg (derivative); Storage Medium - .tif (master) on Gold Mitsui CDRs ; .jpeg (derivative) on SQL server ; Scanning Equipment - Microtek Scanmaker 9800XL; Scanning Date - October 2008.